Are you kidding? By far the thing that needs a patch is the PC version. Protodude, if you can forward this message... ^_^;; Well, the turbo in Rockman/Megaman 1 must be reduced by 1 frame. Actually, the code seems to be the same for all the games, but the collision fails in Rockman 1 - the turbo simulates the buttom being pressed at every frame. The proper fix is to trigger the buttom in even frames (skipping 1). Next, the screen size is 256x224 pixels, upscaled. They're clipping the top and bottom 8 pixels, and it SHOULDN'T! The turbo being way too fast is an annoying oversight, but it can't be patched because it would break the challenge leaderboards. Top and bottom 8 pixels (approximately) were cropped out on televisions of that era, those sections were never meant to be seen while playing. That decision was made intentionally. Old TV videos on youtube are NOT cropped that way. Following your "logic", they should be also cropped. In short words, makes no sense. Why not an NTSC simulation like a few NES emulators do with perfection? Instead, a crap filtering of... "monitor" (?) and "TV" (??). Regarding the turbo, well... bear with that!? Megaman 1 collisions are broken with that turbo speed. Fact. Also... why is the menu music too loud, and the sound effect barely audible? Well look at that! The PS4 version now matches the 3DS version in terms of content. Heh heh heh. 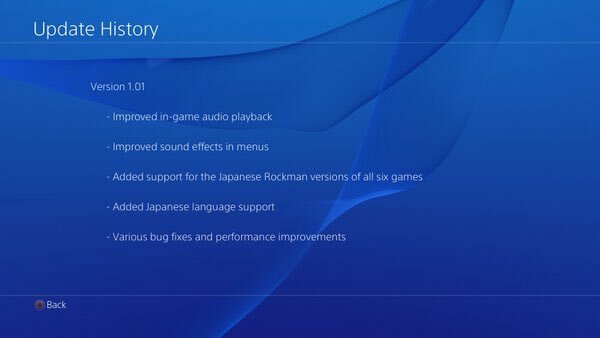 Kidding aside, it's nice that they did this for the PS4 version. Hopefully, the other versions will be updated to match this, as well! Holding out for that 3DS update that fixes up the performance issues in the US versions though. Why don't any of these updates include the ability to change weapons with the L and R shoulder buttons? Again, there's no excuse whatsoever as to why that can't be done in this game, because not only did Legacy Collection take inspiration from the Complete Works series, but if I recall, it was worked on by some of the same people who made Anniversary Collection. Because that would break the immersion of these being the most-accurate 1:1 interpretations of Mega Man 1-6 ever created, right down to all the glitches and functions! ... what? You mean the original games didn't have a Turbo-Fire function? You're lying! Of course they did! These are completely faithful emula-- I mean "reproductions" of the original games, aren't they? Aren't they? Yeah, I knew you were being sarcastic even before you mentioned it. About the Turbo-Fire function... To be fair, there are some NES joystick gamepads that have a turbo button on them, so that may have been where that feature came from. As far as there being some sort of technical issues involved with being able to switch weapons without pausing the game... The ROM hack, Mega Man 3 Improvement, shows that it can be done, but it ended up getting mapped to the select button.